Sorry, davet010. Things were so much better in that corp before the whole BoB disbanding incident. Kinda feel bad bringing you in there now. No worries matey, just unfortunate timing. I'm guessing a lot of them have alts in other corps, and have been out fighting. I just picked up the special edition boxed copy that Atari released this week. Eve is a game that I always wanted to get into, it is right up my ally with the whole macro approach to the game. But it was so unwieldy before that I couldn't ever get up to speed. I heard that Atari/CCP revamped the tutorial and have a hot new players guide included with the game. I'm giving it a go. I'm so warn out from fantasy mmogs. Yep, they completely redid it. I'm not sure it's better than it was before, but it's certainly different. If nothing else, it makes instant alts impossible, which is good in a way, as you can't create throwaway characters for piracy any more. However, the tutorials seem to give you a pretty good footing to start off with though, which combined with very increased training speed at the start, should make things somewhat bearable. Boy am I re-addicted to this game. I think Eve is really suited to taking breaks and coming back because of the way its constant skill training works since you'll have a bunch of new things to play with when you get back. Having a few new level 5 skills to play with essentially without the wait is great (Caldari Cruiser 5 for me in this case). That is, of course, assuming that you're willing to keep your account open for the training. I also picked up the retail box from Amazon the other day. It comes with two months of game time, so the $35 is really quite reasonable for existing players if you're interested in having a manual and shiny box on your desk. The box also comes with a notice about what it calls a special "21 day VIP pass". Essentially its 21 day free trial (as opposed to the usual 14 day) any existing subscribers can extend to others through email. If that trial then gets extended to a full on account the existing player gets credited with 30 free days of game time too. 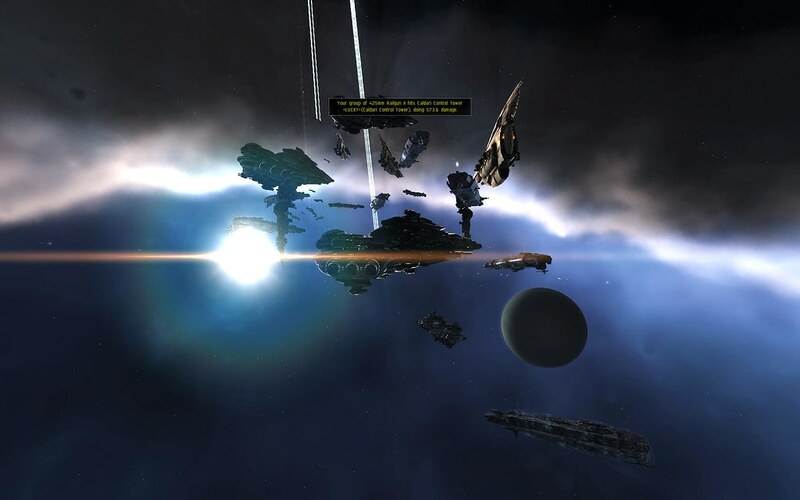 So if anyone from GWJ is interested in trying out Eve, be sure to post something on this thread or PM an existing subscriber so both people can benefit some. I'm back around as well, although in all likelihood until I get done with school I will only be on for minutes at a time to queue up skills. I joined the GWJ chat, though, so perhaps I will see you guys online in the near future. Toon is Hephaestus Jones. Corps in EVE are roughly the same as Guilds in other MMOs. I'd say ask around rookie chat for help(You're stuck in there for the first 30 days). If the GWJ channel is empty, well, goodjers tend to ebb and flow from one game to another, so just leave it open. thanks for the feedback. i've managed to talk to a few goodjers in the gwj channel which has helped alot. With the launch of Apocrypha, I thought I'd give EVE another go. And I'm glad I did -- it really grabbed me this time, and I've upgraded to a full account. I have just over 1.3 million skill points, so I'm almost about to hit the 1.6 million bonus training cap. If anyone else was like me -- on the fence about EVE, or tried it before and never got much further than the first tutorial; give it another try. Apocrypha has reworked the new character tutorials and introduction into a much better experience. Just wanted to say thanks to two regulars of the GWJ channel for getting me on my feet. I've received the "GWJ care package" of 10 million ISK twice now -- once from Elizabeth Lockley and again from fstarta (Promethean Starter). Sorry, I couldn't find the forum name that goes with Elizabeth's in-game name. I'm Brutus Wellforge ingame, a sturdy Minmatar miner/industrialist. I got the Steam deal for Eve yesterday and have been trudging through the tutorials. Its a steep learning curve for someone who knows nothing about the game, but I'm making steady progress. My name in game is Oskar Joad. I keep wanting to get out of my ship and walk around the space stations, its kind of a bummer that we can't do that. Or can we? The expansion that allows you to exit your ship and walk around interacting with others inside stations is on the horizon. There's a chance it will arrive by the end of this year, but that's far from a guarantee. The new tutorials are quite a bit better than what used to pass for the new player experience, but it's still quite a bit to learn all at once in the beginning. Just be sure you actually watch the Rookie Help channel that you're in for the first 30 days, as it can be quite helpful. On the other hand, it's good to ignore your newbie corp channel as the conversation in there will kill your brain cells. You know, just the promise that its on the horizon is good enough for me. From reading the glowing reviews regarding the changes in Apocrypha it looks like the tutorials are a godsend for new players. I used to play alot of Anarchy Online, another notoriously difficult sci-fi game, and there was a certain pride in being an 'expert' at it. Best thing for a new player to do is to join a corp and hang around them for awhile, doing missions together etc. Otherwise you're on your own. I can't decide if I'm excited about being able to exit my ship or not, I sort of like that Eve doesn't do that, makes it unique and also you don't have that annoying need to make your avatar look wildly ridiculous so that they stand out in the sea of everyone else's avatars. At least with the character pictures they have currently, it's less distracting. But who knows, it could be a big improvement. Ya, your default starting NPC corp chat channel is the Barrens chat of Eve. Couldn't care less about 'walking in stations', I'm here to pilot cool looking starships around, not play Sims in Spacestations. Oh, and make things go boom, pretty explosions. Those 30m SP in 'making things go boom' certainly isn't going to waste. I hope the walk-in-station upgrade doesn't make me walk around to get stuff done. Right now, I can refine, fit, insure etc all from a handy menu as soon as I dock. If I've got to walk from the hangar to the refinery, then to the fitting bay, to the insurance office, then to an agent, then back to the hangar to launch, then I'm going to be annoyed. In fact, I'm going to need a giant snow leopard to ride on. They've already said that ambulation will be 100% optional. Nothing that you can currently do from inside your ship will require getting out of it upon release. It's going to be all about additional content, and alternate ways to access some of the old functions. I'm looking forward to ambulation too. I know I already spend a good amount of time just sitting in the station talking to my corp mates and doing trade stuff as it is. Getting a little board room to meet in and play mini games or something would be cool. A novelty, sure, but then again look at how many people in high sec fly around in faction fitted ships. Novelty is one of Eve's biggest selling points. In the meantime I'll try and remember to join the gwj channel for when I return, because what was said about it being a very clean "phasing" MMO that makes for great breaks and returns is SO TRUE. I think that's one of the reasons it's always grown over the years in the shadow of giants like WoW, never receding in popularity overall but ever so slowly growing. A lot of the high profile fantasy MMOs seem to be prone to violent bursts of activity and equally violent burnouts. 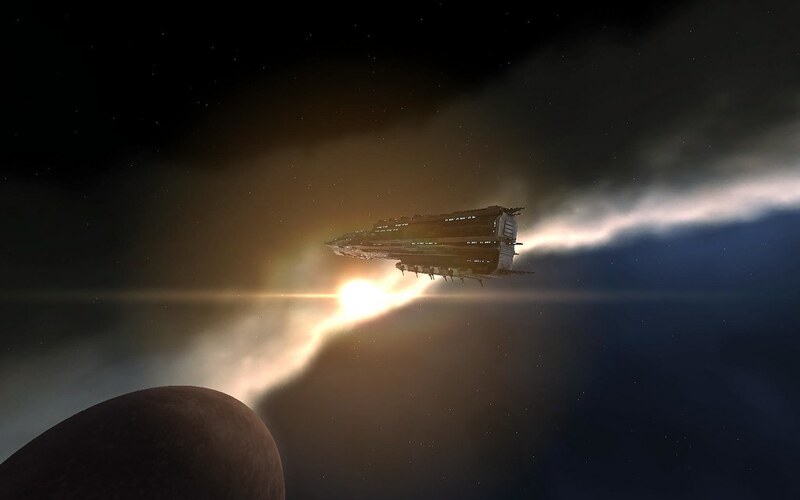 The average EVE player tends to wax and wane quietly, but remains quite loyal. The alliance I joined up with is the Intepid Crossing alliance, which mostly inhabits the Etherium Reach region in what is know as the 'Drone Regions' of 0.0 (middle right on the above map) . 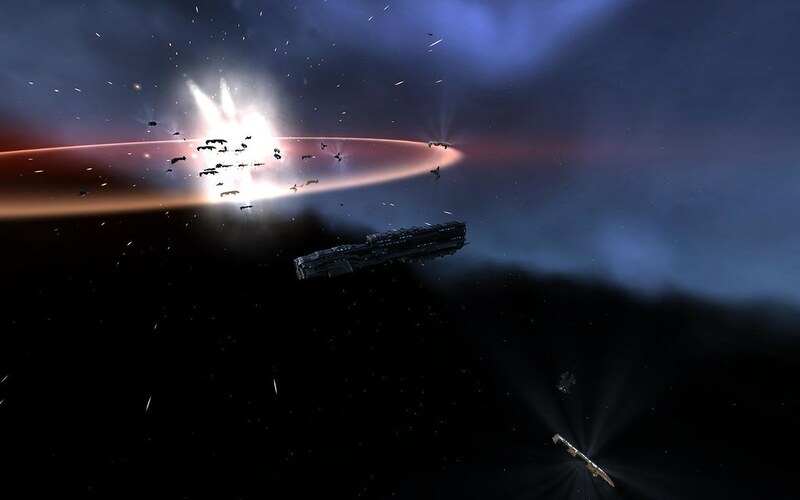 Intrepid Crossing and its sister alliance Ethereal Dawn have been embroiled in a major war with Red Alliance and its allies for several months now, and it appears that I am showing up at the tail end of the war. Red Alliance, one of the several major Russian alliances in the game, has a long reputation for being a very capable and tenacious PvP alliance and has made at least on legendary comeback in its history. As such, counting them out completely at this point is probably not a very wise thing to do. Their fortunes have, however, turned recently due to several factors as far as I can tell. One is that RA has recently come under heavy assault from Atlas Alliance from the south and is pretty much getting steamrolled in that theater. Additionally, some type of internal coup was attempted last week. The details are hazy (as is usually the case with Russian Eve politics), but supposedly some parts of the alliance wanted to abandon all sovereignty holding activies, essentially closing up shop and becoming a large roaming entity. This didn't prove to be too popular and through some confusing shenanigans with executor corps and alliance share swapping the more mainstream elements were able to wrest official control back. Several important corps have left RA because of this though, and because of that they have lost sovereignty and more importantly fleet numbers in several key places. We (IRC and ED) are now launching major attacks on all fronts to take advantage of this and it appears that we will have resecured virtually all of the systems RA took from us and more in Etherium Reach and Insmother by the end of the week or so. Its been pretty exciting and certainly very different from the quiet Empire life I used to live in Eve. At most times of the day there's a major fleet op (50-300 pilots) to join up with or smaller roaming gangs and such. Anyway, I'll keep updating here if there seems to be any interest. Feel free to ask questions! How does PvP pay for itself? I've been reading a few EVE blogs, and the life of a pirate sounds great, roaming around, blowing up the weak, no fixed home, arrrr! Avast! However, eventually your ship is going to be destroyed, and quite possibly you're going to be podded, too. Probably until you're good at PvP, you get blown up more often then not. Is the stuff you can salvage from player's wrecks enough to keep you in frigates and modules? Many of the pirate bloggers seem perfectly happy to lose a ship if they destroy one or two themselves, but they don't seem to mention how they bankroll their pirate lifestyle. Running missions on the side? Fleet PvP pays for itself through loot and salvage of your foes. If you're talking small gang PvP, same deal. Most folks who are heavy into piracy have a side alt that they run missions with, mine, invent, etc. I'd imagine you'll find very few people who play without alts. Indeed AnimeJ. I've got an alt in Empire that trades, invents, and manufactures in that order. Also, if you're flying insured T1 ships the cost of losing stuff is really quite low. You essentially just end up paying for the mods, which I imagine you could pay for by looting others' mods easily enough. Shoot, fit out T1 right, and you've lost next to nothing, mods included. 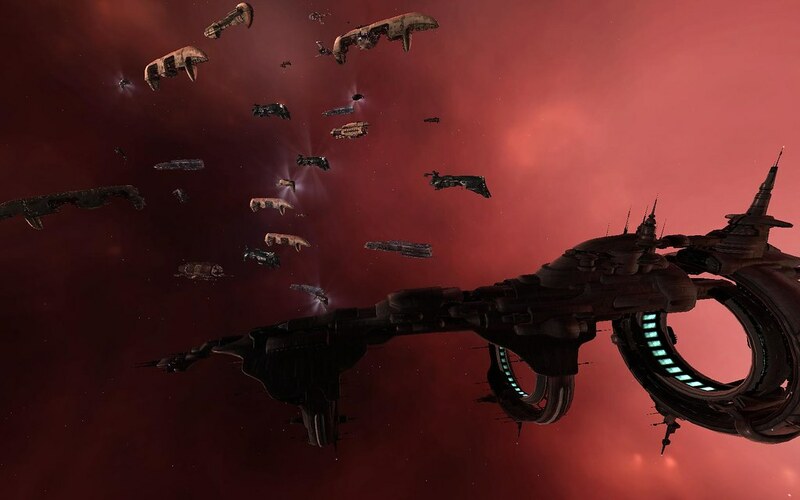 EVE Uni's pvp fits are pretty much built on that principle. Hey I'm resubbing my EVE acount today or tomorrow depending on the download. Is there an in game chat you guys use to keep in touch? Or is everyone scattered? I'll probably be roaming in low sec looking for a corp to join, if anyone has a spot for a newb in a vexor I'm your man! Info is both buried in this thread and conveniently located in the sticky. Yea I saw that, the sticky said that there was a GWJ channel, but it didn't specify what it was. My first guess would be GWJ though =P. I've only played a total of 3 or 4 months on my character. Probably have 15m isk and my 1 decked out drone vexor. Any advice you have to ease me back in would be great! Yep, name is GWJ. Only difference is that my sub is inactive currently, so I'm not hanging out so much anymore. Anyway, as soon as I get the new client downloaded I'll be back in. Name is Denis Jacquard, Intaki. IIRC I was somewhere in the Intaki system when I last logged out so I suppose I'm still there. I'll start looking the folks here up as soon as I get running again.